Directions: add #1212 to fuel tank - spray #3636 air intake into throttle plate area (half can with engine not running, other half while engine is running) - draw #303 Combustion Chamber Cleaner through vacuum source near throttle plate at 2500 rpm. Caution: This product may be used on any vehicle regardless of age or mileage. The caution that technicians must be aware of is to ensure that the engine rpm be maintained at 2500 while the Combustion Chamber Cleaner is drawn through a vacuum source. Anytime you are introducing a fluid past the injectors there is a risk that some fluid may puddle up somewhere in the manifold and not atomize entirely into the combustion chamber. This risk is heightened if the engine is stalled on the product, and eliminated as long as the rpm is kept up to 2500. Run the engine for a minute or two after the product has all been introduced. This cleans out the tool and effectively atomizes all fluid in the system. What is a Complete Fuel Injection Service? The SelTec® Complete Fuel Injection Service is a complete upper engine induction cleaning. Some people refer to this procedure as a flush, purge, or de-carbonization. The SelTec® Complete Fuel Injection service is effective at helping vehicles pass emission standard testing, so it can also be referred to as an Emission Service. The SelTec® Complete Fuel Injection Flush Kit contains 3 parts, including theSelTec® Fuel System Cleaner #1212 that is installed into the tank. This provides all of the benefits laid out in the previous section on Fuel System Service, such as removing water and cleaning fuel injectors. The other 2 parts are SelTec® Air Intake Cleaner #3636, and SelTec® Combustion Chamber Cleaner #303. The first step in this procedure is to install the #1212 tank additive. The second step is to clean the throttle body and air intake system with the #3636. This is a one-job size can of high quality air intake cleaner. It is effective at removing deposits from the throttle plates, throttle body, plenum, manifold, and is safe on all sensors including the IAC (Idle Air Control) valve. Why do we need to clean the air intake system? Another design change that resulted from downsizing these fuel-injected engines to meet EPA specifications is that we no longer vent exhaust gases to the atmosphere. Today's fuel injected engines now have an EGR (Exhaust Gas Re-circulation) valve, which does exactly what it says. We are re-circulating (recycling) exhaust gases that previously were vented to the atmosphere, back through the engine to be re-burned. By re-burning these exhaust gases we reduce emissions and generate better fuel economy and engine efficiency. The only problem is that they also create substantial deposits in the air intake system. The EGR will create deposits in some engines as early as 2,000 miles. These deposits are typically soft (some are hard) hydrocarbon deposits from both oil and fuel. The deposits cling to all the surfaces throughout the air induction system, such as the throttle plates, plenum, manifold, runners, and sensors. The impact these deposits have on engine efficiency is that they impede airflow and degrade both fuel economy and drive-ability. Volumetric efficiency is the maximum amount of airflow through the air intake system to feed the combustion chamber. When an engine is new and the air intake system is clean, it functions at the optimum level of volumetric efficiency. Engineers go to great lengths to design manifolds and runners to optimize volumetric efficiency. Even the untrained eye can notice the aerodynamic design of the manifolds on these new high-tech engines. Cleaning the air intake system is an important part of the SelTec® Complete Fuel Injection Service. We have packaged the #3636 in a one-job size can, as part of a 3-part kit, so that the kit goes on the RO (repair order) as one part. The customer has paid for the entire can so the technicians will use the entire can on each job. There seems to be a lot of product in a can, you will get tired of spraying, however, it is important to use the whole can on each job. Spraying down the air intake system prior to drawing the SelTec® Combustion Chamber Cleaner #303 through, helps by cleaning most of the deposits in the plenum, and softening the rest, so that the #303 can finish the job as it is drawn through a vacuum source near the throttle plates. This method does a double cleaning of the air intake system, improving volumetric efficiency and overall engine performance. We recommend that the #3636 be sprayed into the throttle plate area while the engine is not running, so that you can open up the throttle plate to get behind it. You should use approximately ½ of the can while the engine is not running, then start the engine and run the remainder of the can in through the throttle plate while the engine is running. This is important because the engine must be running to get the product into the IAC valve. This product is safe on all sensors. If there is a MAF (Mass Airflow Sensor) up-line from the throttle plate, then the engine may not want to run with the boot off the air intake system. In this case you have no choice but to run the whole can in with the engine off. Ford engineers began putting a Teflon coating on their plenums a few years ago. The idea was to assist in keeping the plenum clean. Unfortunately, most Ford technicians agree that this procedure did not accomplish what it was meant to do, and apparently Ford is gradually discontinuing this practice. The Ford plenums gum-up as much (some say more) than the non-coated plenums. Ford technicians are concerned that the SelTec® Air Intake Cleaner may remove the Teflon coating. In order to have any impact on the coating you would have to spray continuously in one spot, and even then the amount Teflon removed would be slight. The recommended method of spraying the #3636 into the air intake system is to move the spray around to cover as much area as possible. When used properly there is virtually no chance of removing the coating with one application - the deposits will come off first, but the coating remains. Is using a vacuum source effective? The third step of the SelTec® Complete Fuel Injection Service is to install theSelTec® Combustion Chamber Cleaner #303 through a vacuum source at 2500 rpm. Some technicians feel that it is better to flush the injectors by installing the chemical through the test port on the fuel rail. This is a logical assumption, and in the early years of fuel injection, going in through the rail was undoubtedly the preferred method. It was the preferred method because the injectors were more susceptible to deposits. Some of the current mind-set that supports a fuel rail injector flush as opposed to a chamber (vacuum source) service is a carry-over from when we all used to do it that way. In order to understand the benefits of a chamber service over a rail flush you will need to understand the difference in procedures. A fuel rail injector flush is performed by disabling the fuel pump, blocking the return line, and installing the chemical through the test port (Schrader valve) on the fuel rail via a canister charged with air. The obvious benefit to this method is that since the fuel pump is disabled, the engine is running on the chemical, flushing the injectors at full concentration. This is a true injector flush, however, it is only beneficial if there are deposits in the injectors. 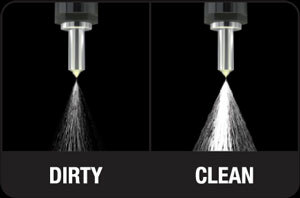 If there are no deposits, then it is not necessary to subject the injectors to aggressive chemical cleaners. In fact, repeated services could be detrimental to the sensitive components of the injectors. If the majority of the deposits impacting drive-ability were found in the manifold and air induction system, then it would make more sense to draw the chemical through the plenum. A good example of this is vehicles that have a secondary throttle plate located in the manifold. This secondary throttle plate is designed to open up at high rpm, such as when you step on the gas to pass a vehicle, to give increased power when needed, and to conserve energy and fuel at lower rpm's. Technicians are finding that when the secondary throttle plate is not used frequently it tends to gum-up with the same soft deposits that are created by the EGR in the manifold area. It can become sticky to the point where it will not work properly when needed, having a negative impact on drive-ability. With dramatic improvements in injectors we are finding that they are virtually deposit free - the majority of deposits impacting drive-ability are coming from EGR deposits throughout the air intake system, combustion chamber and intake valve deposits. If we flush injectors that do not need to be flushed, then we are bypassing the most important area, which is the manifold. Not only does this diminish the value and benefits of the service, but it is also in some cases can be harmful to injectors, as pointed out earlier in the GM bulletin. To make matters worse, some technicians are still using old chemical technology on injectors, such as aerosol types of chemical. The aerosols are all essentially the same chemistry - they are varnish removers and do little to no good as far as removing hard carbon deposits from intake valves or combustion chamber. They were designed to flush injectors and never were developed to remove carbon. The aerosol is convenient in that the technician does not require another canister and air source; the aerosol is its own canister and pressure system. It is a critical mistake on the part of the technician to sacrifice the value and benefits of a chamber service that cleans the entire induction system, intake valves and combustion chamber, for the convenience of flushing injectors with an aerosol, that do not need to be flushed in the first place. The SelTec® Complete Fuel Injection Service is a chamber service (vacuum feed), not an injector flush. We are getting excellent results drawing the chemical through the manifold, without causing any concern to injectors. These are dramatic results that were achieved by doing a before and after hot compression test on a vehicle that we installed the Complete Fuel Injection Service. In this case we performed a hot compression test prior to performing the Complete Fuel Injection Service, then installed the 3 part SelTec® Complete Fuel Injection Kit, performed a 10 minute road test, and did the second compression test. To improve compression means to improve fuel economy, performance, and restore overall engine efficiency. These results were achieved purely as a result of drawing the chemical through a vacuum source. Is it ever necessary to flush injectors (ie: gas problems)? There are cases when injectors need to be flushed, at which time we would fully support that method. However, it is not advisable to flush injectors as a maintenance service - only as a drive-ability condition when it is determined that the injectors are the problem. A case in point is the recent problems experienced from the use of bad gas. Early in 2003 we began to see a high incidence of injector problems in the poppet style valves on certain models of GM engines. We then began to see problems with fuel sending units on Chrysler vehicles. After much research it was conclusively established that the problems were a result of the use of Shell gas. Shell had recently made some alterations to additives they were using in their fuel. These additives were creating deposits. This became such an extensive problem that Shell eventually agreed to pay the warranty costs to fix the problem. The fix that GM recommended was to flush the injectors through the rail. In many cases the vehicle would have to be flushed a second and even a third time. This recommendation from GM to fix a particular problem led some GM dealers to believe that it was a good idea to flush the injectors as regular maintenance. It wasn't long before GM issued the bulletin cited earlier, where they recommend not flushing the injectors as maintenance, only when there is a drive-ability condition. In cases where injectors are suspected of having deposit related problems, andSelTec® Fuel System Cleaner in the gas tank is deemed not aggressive enough, theSelTec® Complete Fuel System service can be done by introducing the #303 into the rail at the Schrader valve with the use of a canister type tool. The product passes through the injectors, cleaning them and then burns in the combustion chamber.